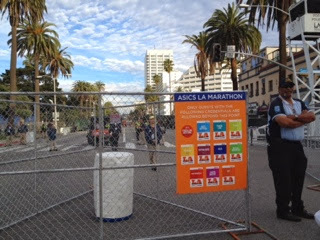 After six Los Angeles Marathon-s, I decided to sit out this year's event. It was a hard decision. For the last few years, I remember shivering at Dodger Stadium for hours before the race, wondering why I keep putting myself through this. I haven't exactly been doing well at LA Marathon (save my somewhat-close-to-PR run in 2012), and with the growing price tag, I decided to see what would happen if I didn't run it. So "The Ukrainian" registered as usual, and I was now the chauffeur. This was probably a boon for him, since I was able to drop him off at Dodger Stadium without having to wake up at 3 AM to park in Santa Monica and take a shuttle. 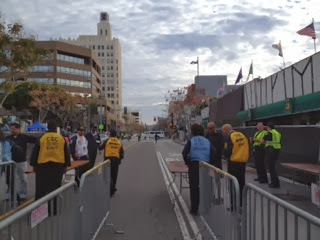 The drop-off area was kind of crazy, but I made it out all right and proceeded to take my sister to the finish area in Santa Monica so she could do the ever-important duty of passing out cold towels at the finish. Since the day's arrangements were not known to me until very close to the day, I couldn't sign up to volunteer. Thus, I decided to do something practically unheard of for me, which was to just enjoy the marathon atmosphere in Santa Monica. I wound up walking around everywhere, trying to catch glimpses of the action (apparently there were good places to spectate still, but I didn't want to stay in one place too long). At some point, I had a chia seed bowl. 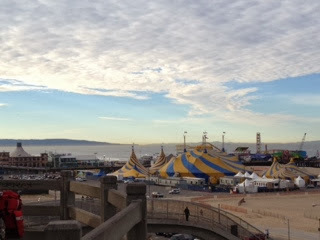 Mostly, I was just enjoying a Sunday morning at a place I haven't been to for, well, a year. 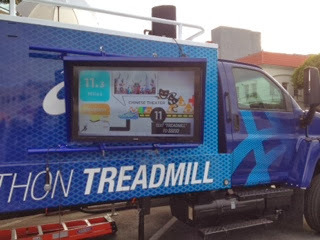 I watched some people try to last on a treadmill going at the marathon record pace (approximately 12.4 mph). Though I wanted to try, I had already eaten something, and the sun was full-on out. Okay, and I was also afraid of making a fool out of myself in front of all those people, blah. As the morning wore on, I was worried about "The Ukrainian," as both of us don't do well in any sort of heat. Luckily, I had signed up for runner tracking that would send his progress to my e-mail. I kind of freaked out when I didn't hear anything for a long time after the 10K point, but I guess half-marathon (13.1) was not a check-point. Security was definitely stepped up this year. 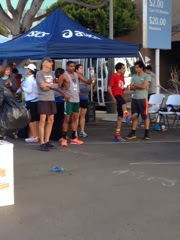 I got scanned when I entered the area near the finish line. This made me feel safe, though it IS a haunting reminder of what happened April 15, 2013. Far in the distance in this picture... is the finish line. LA Marathon will always have a special place in my heart, as it was my first marathon and traverses areas that I know well. Also, with this being the 29th running, it is pretty much as old as I am! However, I must say that given some of the things I mentioned above (and the heat, which I know they couldn't help! ), I know I made the right decision. 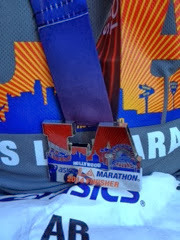 I also wasn't the biggest fan of the logos on the medals and tees, either. "The Ukrainian" got a medium, and it looked HUGE. This is not to say that I won't be returning (it looks like 2016 is a possibility due to the Olympic trials), but I'm enjoying the little break. Congrats to "The Ukrainian" a.k.a your hubs! It's neat to read from a spectators point of view too. Look forward to hearing how Big Sur goes. I actually joined a walking/running team - training started last weekend, so hoping working with a trainer/coach is the motivation I need.